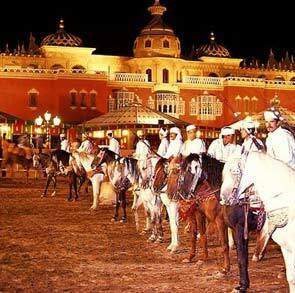 Live Moroccan folklore with the dinner and the show’s “Chez Ali“. A characteristic of the thousand and one nights show presented in a Palm Grove, along with Berber tents. After enjoying a traditional meal, sitting between cushions on the floor, will begin the show with dance of the belly, horses and incredible tricks such as seeing a sultan mounted a flying carpet. Our fantastic evening full of magic in “Chez Ali”, a typical restaurant located in the Palm Grove of Marrakesh will begin at 19:30 (20:30 in summer) in the evening. Here we will have the opportunity to taste delicious traditional Moroccan cuisine in a real setting. We will try Harira, a soup of vegetables with rice, couscous, and grilled lamb. We will also enjoy the Jourara, made from puff pastry with cream and nuts, and the typical Moroccan pastries and tea. After your delicious dinner in the heart of Marrakech, you will be immersed in a world of fantasy. A fascinating show starring riders, gunpowder, music and dance that transports you to the unique atmosphere of the Thousand and One Nights. 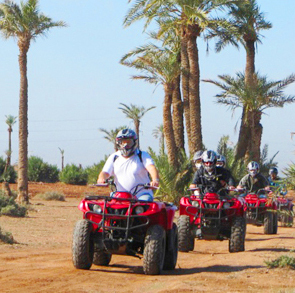 It is an exotic show that will be an unforgettable experience of Morocco.